I am sending these stars to myself to hand out to the units of the bases my combat stress team supports. These stars are to represent those who have served, are currently serving, and to those of us who have paid the ultimate sacrafice. You will never be forgotten. To read previous messages, clink on the link below. .For All The fallen Security Forces Members. Gone but never forgotten. The U.S. Flag stands for the freedom that you defend. Please accept this Star carefully prepared from a retired U.S. Flag. It is presented from a grateful nation for your service and sacrifice to defend our freedom. I want to thank you for this program and for supporting the US Military. I will be giving these starts to the Marines and Sailors that I am currently serving with. We are currently deployed on the USS Makin Island (LHD-8) in support of operations around the globe. I have a friend that recently received a star, however it was damaged during his training. He is leaving on deployment soon, and I am trying to get a new star to him before he leaves. It was something special to him, and he was very disappointed when it was damaged. I will see him on the 4th of July before he leaves on his deployment and I am hoping to get the stars before then so I can give it to him personally. Here is a star from an American flag which flew as honorably as you serve every day. Consider it a thank you from all Americans; as not everyone understands exactly what hardships are experienced through deployment, it's comforting to know you have an entire country behind what you do. And within that country is your wife who loves you more and more as the days pass. I'd mail you a star from the sky if I could because you're my star, my rock, my everything. Yet I know this particular star will mean much more than any other one I could send your way. 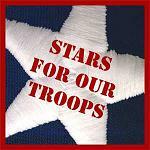 Thanks to Stars For Our Troops for getting this to you. I love you. Thank you. The U.S. Flag stands for the freedom that you defended. Please accept this Star carefully prepared from a retired U.S. Flag. It is presented to gratefully honor and thank you for your Military Service and Dedication to Our Country.